After the large and fundamental problems are settled, certain minor reforms, and elaborations of these, are necessary. These detailed reforms may be likened to the equally distinct but relatively small marks of the panther's coat. As a consequence, a change also takes place among the inferior people. In conformity with the new order, they likewise "molt." This molting, it is true, does not go very deep, but that is not to be expected. We must be satisfied with the attainable. If we should go too far and try to achieve too much, it would lead to unrest and misfortune. For the object of a great revolution is the attainment of clarified, secure conditions ensuring a general stabilization on the basis of what is possible at the moment. Changes ought to be undertaken only when there is nothing else to be done. Therefore at first the utmost restraint is necessary. One must becomes firm in one's mind, control oneself - yellow is the color of the means, and the cow is the symbol of docility - and refrain from doing anything for the time being, because any premature offensive will bring evil results. The Chinese character for this hexagram means in its original sense an animal's pelt, which is changed in the course of the year by molting. From this word is carried over to apply to the "moltings" in political life, the great revolutions connected with changes of governments. 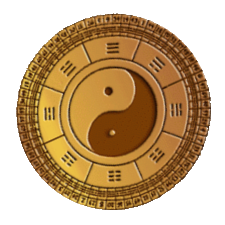 The two trigrams making up the hexagram are the same two that appear in Kui, Opposition (hexagram 38), that is, the two younger daughters, Li and Dui. But while there the elder of the two daughters is above, and what results is essentially only an opposition of tendencies, here the younger daughter is above. The influences are in actual conflict, and the forces combat each other like fire and water (lake), each trying to destroy the other. Hence the idea of revolution. The setup of a well must necessarily be revolutionized in the course of time. Hence there follows the hexagram of Revolution. A well must be cleaned out from time to time or it will become clogged with mud. Therefore the hexagram Jing, the Well, which means a permanent setup, is followed by the hexagram of Revolution, showing the need of changes in long-established institutions, in order to keep them from stagnating. Revolution means removal of that which is antiquated. The hexagram is so constructed that the influences of the two primary trigrams are in opposition; hence a revolution develops inevitably. 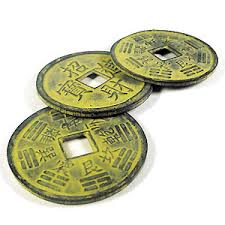 Fire (Li), below, is quickened by the nuclear trigram Xun, meaning wind or wood. The upper nuclear trigram Qian provides the necessary firmness. The entire movement of the hexagram is directed upward. Revolution. Water and fire subdue each other. Two daughters dwell together, but their views bar mutual understanding. This means revolution. “On your own day you are believed”: one brings about a revolution and in doing so is trusted. Enlightenment, and thereby joyousness: you create great success through justice. Heaven and earth bring about revolution, and the four seasons complete themselves thereby. Tang and Wu brought about political revolutions because they were submissive toward heaven and in accord with men. The time of Revolution is truly great. Molting depends on fixed laws; it is prepared in advance. The same is true of political revolutions. The expression “on your own day” points—as in the case of the hexagram Gu, Work on what has been spoiled (18) - to one of the ten cyclic signs. These ten cyclic signs are: 1. jia 2. yi 3. bing 4. ding 5. wu 6. ji 7. geng 8. xin 9. ren 10. gui. 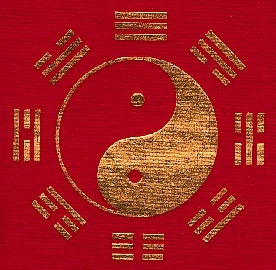 As noted earlier in connection with hexagram 18, the eighth of these signs, xin [metal, autumn], has also the secondary meaning of renewal, and the seventh, geng, means change. Now the sign before geng is ji, hence it is on the day before the change takes place that one is believed (therefore the rendering “your own day”; ji also means “own”). 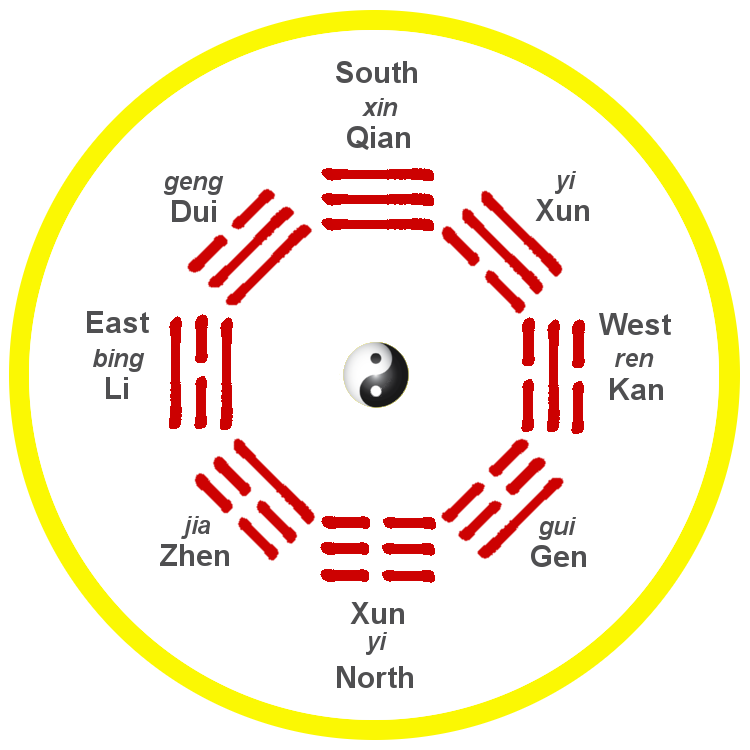 If the cyclic signs are combined with the eight trigrams as correlated with the cardinal points in the Sequence of Later Heaven [Inner-World Arrangement], it will be found that Kun stands for ji — which means earth - in the southwest, midway between Dui in the west and Li in the south, that is, between the two trigrams that combat and subdue each other. 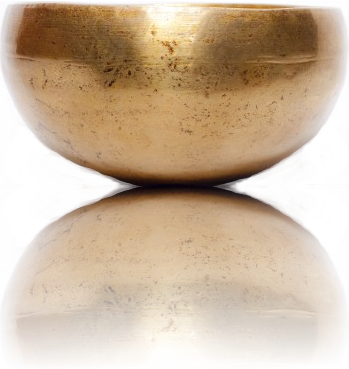 The earth in the middle balances their influences, so that the clarity of fire (Li) and the joyousness of water (Dui) can manifest themselves separately. Hence the need of enlightenment and joyousness in gaining the popular confidence necessary for a revolution.As revolutions in nature take place according to fixed laws and thus give rise to the cycle of the year, so political revolutions—these can become necessary at times for doing away with a state of decay - must follow definite laws. First, one must be able to await the right moment. Second, one must proceed in the right way, so that one will have the sympathy of the people and so that excesses will be avoided. Third, one must be correct and entirely free of all selfish motives. Fourth, the change must answer a real need. This was the character of the great revolutions brought about in the past by the rulers Tang and Wu.